Chris Difford is a rare breed. As a member of one of London’s best-loved bands, the Squeeze co-founder has made a lasting contribution to English music with hits such as ‘Cool For Cats’, ‘Up The Junction’, ‘Labelled With Love’, ‘Hourglass’ and ‘Tempted’. 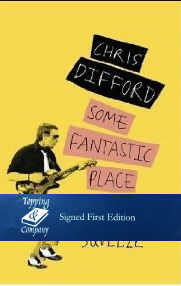 Even before his first release in 1977, his love of writing lyrics has never wavered.In Some Fantastic Place, Chris Difford charts his life from his early days as a dreaming boy in south London with a talent for poetry to becoming a member of one of Britain’s greatest bands and beyond. Along the way he reveals the inspiration and stories behind Squeeze’s best-known songs, and his greatest highs and lows from over four decades of making music.